U.S. Air Force fighter jets may soon be able to instantly disable enemy targets using invisible, energized beams of light shot from a small, compact laser cannon. The laser-equipped vehicles might call to mind the heavily armed "helicarriers" from Marvel's "Captain America" films. Yesterday (Nov 6), the U.S. Air Force Research Lab signed a $26.3 million contract with Lockheed Martin to develop high-energy laser weapons that are lightweight and compact enough to be mounted on fighter jets. Lockheed Martin is a defense, aerospace and technology company headquartered in Bethesda, Maryland. There's nothing new about laser weaponry, but most laser systems that are powerful enough to be effective are too heavy and bulky to be carried by a plane. Rather, most of these lasers are limited to ground and sea use. But now, that's changing. 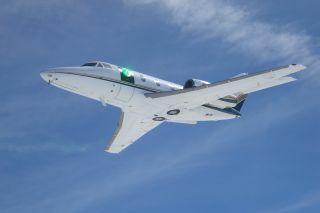 Lockheed Martin conducted flight tests in 2015 with laser-equipped research planes to determine whether mounting powerful lasers on planes was feasible. The new contract is part of the LANCE program, or Laser Advancements for Next-generation Compact Environments, which seeks to develop a high-power laser that can disable military targets without weighing down the plane carrying the weapon. LANCE, along with research developing targeting and cooling systems, falls within the Air Force Research Laboratory's Self-Protect High Energy Laser Demonstrator (SHiELD) initiative. Unlike the colorful, bullet-like lasers that fly back and forth between Stormtroopers and Rebel soldiers in the "Star Wars" films, real-life laser weapons are invisible and travel to their targets at the speed of light. The weapons can be used to destroy or disable rockets, drones and vehicles, sometimes without leaving any external sign of the damage — although some lasers can burn holes into their targets. Lockheed Martin said that it envisions that lasers, once they become more commonplace and lightweight, better equipping soldiers to disable new threats that didn’t exist a few years ago. For instance, lasers could help U.S. armed forces target small, cheap drones or explosives that are hard to hit with traditional guns and defense systems. The company refers to those traditional systems as kinetic weapons, because they launch physical projectiles, such as bullets or missiles. "I really see laser weapons and kinetic weapons being side by side on the battlefield, and together providing the defense that our forces need against traditional threats — kinetic weapons — emerging, inexpensive proliferated threats — laser weapons," Iain McKinnie, the business development lead for laser sensors and systems at Lockheed Martin said in a video the company produced about laser weaponry. "This advanced turret design will enable tactical aircraft to have the same laser-weapon-system advantages as ground vehicles and ships," Doug Graham, the vice president of missile systems and advanced programs at Lockheed Martin Space Systems, said in a statement after the 2015 test flights. Under the terms of the contract, Lockheed Martin plans to test a high-energy laser weapon mounted on a fighter jet by 2021.